Come and experience our stylish lounge and comfortable rooms during your stay in the City Centre of The Hague. Guests recommend our hotel for the excellent location and friendly staff. We look forward to welcoming you soon. The ibis Den Haag City Centre is located in the heart of the 'Court City', a stone's throw from the Grand Church and the old City Hall. Take a look at the Knight's Hall at the Binnenhof and visit the Haags Historical Museum. Enjoy the wide range of shops in the Spuistraat and Venestraat, the Haagsche Bluf shopping district and the covered Passage shopping mall. See The Hague from a different angle and enjoy a trip on the city's canals. 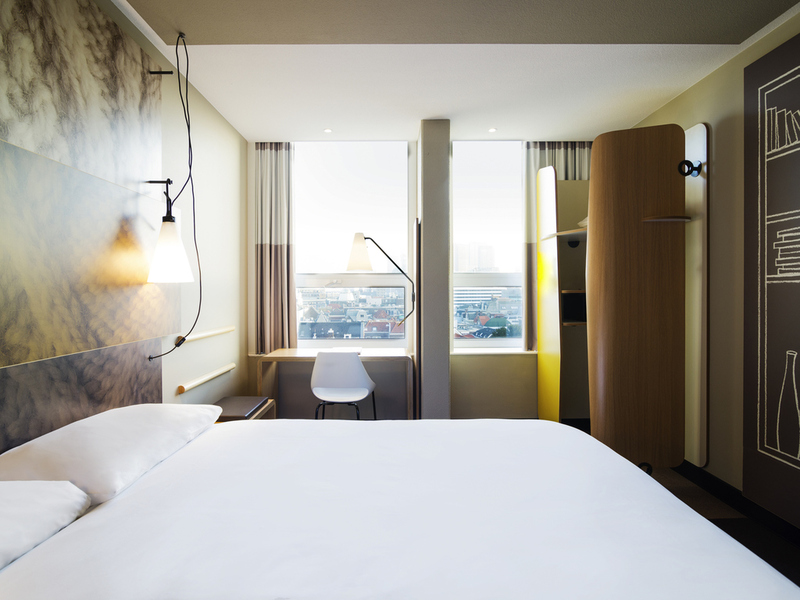 Inviting, modern and cozy: this describes the rooms at ibis Den Haag City Centre. All rooms are equipped with a comfortable bed, a bathroom and free WIFI - everything you need for a pleasant stay. Relax at the bar: The ibis bar is the perfect place to come and have a well deserved rest, whatever the time of day. Staff attentive and polite, room clean and comfortable. The hotel was very nice but the room was very bare bones. Not even a coffee maker. Very centrally located....courteous crew/staff ...no rush neither for checking in nor checking out...room clean and neat....breakfast swell! ... In one word: IBISIMOOOOO! . I stayed for two nights and was pleased with my stay. The room was clean, spacious and silent. I would just improve the possibility for customers to iron clothes in their room by delivering irons and boards on request. Useful when travelling for work. This was a very central located and clean hotel, prefect for a business trip or a holiday in The Hague. The lobby/bar area was nice and modern, inviting for a stop there to meet up with other guests before and after work/dinner etc. The breakfast area was quiet and had a nice view against east (morning sun) and a beautiful green park back yard (part of another restaurant just around the corner). Good variety of food for breakfast! Excellent. The location is great and the rooms are quiet. Perfect for a one night stay if you don't want to pay too much and don't need all the luxury stuff. It's right in the middle of The Hague, the 'Paard' venue, shopping streets, restaurants and bars all around the corner, it's clean and cheap, great for a 1 or 2 night or a business stay. The room has a safe too, didn't expect that. The hotel is easily accessible by public transport (2 stops by tram from central station). Too bad there's no coffee or waterboiler in the room, and staff isn't really alert, I waited for more than 5 minutes at the bar for a coffee, there were 2 staff 10 meters away doing nothing, they had definitely seen me (I kinda stick out from 'normal people' so it's hard not to see me), but I finally had to go ask one of them to help me. When I asked them if they could email me the invoice I was immediately checked out, when it was very obvious I was not checking out yet. I had to have my key card reactivated to get upstairs to our room... Also the room airco/ventilation system is quite noisy, it starts early mornings and stops at 11pm, it can't be controlled manually. Other than that we had no complaints. Stay it self was OK. Only one think was bad and that shower was broken. Generally excellent apart from the temperature controls, it was too hot some of the night - we could open the window but were kept awake by rowdy street behaviour. we sray here for 2 nights all in all our experiance was good and above a. location was very good cleanness was good and room facilities was a. Fine staying. Friendly and competent staff. Your staff are a credit to you. Helpful and polite and even fun. Unfussy, modern and attractive room design. Quiet. Yes, quiet. Really. Effective and spacious shower room. I liked the shower gel dispensers - body soap and hair shampoo in one wall-mounted squeeze tube. Easy to use and no unnecessary plastic waste from multiple small containers. Why can't everyone do this. Hotel was well-located for museums and restaurants. Only negative was that no-one else was having lunch at Ibis the day I used the hotel cafe, so nothing was ready. But staff made me a sandwich from available ingredients and explained the wait. Catch22; more guests use the service, the better it works. It was convenient to have my sandwich there so I could use my free WiFi in the same building I was staying at while I had some food, then return the laptop to my room and go out for the afternoon after using my room facilities. It made sense to me. Clean, comfortable, and friendly staff! The hotel is modern, very well-located, comfortable, well-designed. The staff is professional and friendly. The beds are very comfortable, my room was facing the wonderful courtyard and was very quiet. The breakfast is very good. I highly recommend this hotel for staying in Hague. Clean comfortable rooms, polite staff, great location. We have been here before so we knew what to expect. Nice room and very pleasant staff.